Last year, a TaskRabbit named Charlie scored $1,500 for waiting in line for 100 hours for the iPhone 5. Can't wait to get the new iPhone 5S or 5C, but can't stand the thought of camping out for days or waking up at dawn? Instead, you can pay someone to hold your place in line. TaskRabbit, an odd-jobs hiring service, is advertising that people can pay "line-sitters" to go to Apple stores early on Friday. Users can set their own rates, but the company is suggesting a price of $14 per hour for people to wait in line. TaskRabbit launched its "Skip the Line" campaign immediately after Apple (AAPL) announced its new iPhone 5S and iPhone 5C. "We were basically sitting there waiting to send the email as soon as someone finally said the word 'iPhone,'" said TaskRabbit spokesman Johnny Brackett. Here's how TaskRabbit works: Users post a task, along with the price they'd ideally like to pay someone to complete it. TaskRabbits -- who Brackett said go through extensive background checks before approval -- can bid to do the job for more or less than the poster's request. The task-poster then selects one of the bidders. Once the poster is satisfied with the job done, TaskRabbits are paid via credit card for the task and reimbursed for any incurred costs. The company also charges the poster a 20% service fee. For the "Skip the Line" iPhone campaign, the company determined that it's too difficult for TaskRabbits to buy iPhones without the task-poster being present with their data plan information. Plus, it's a lot of money for the TaskRabbit to shell out up front. As of midday Wednesday, the TaskRabbit site featured 250 Skip the Line tasks, according to Brackett. Other sites like Craigslist also featured people seeking or offering to be iPhone line holders. 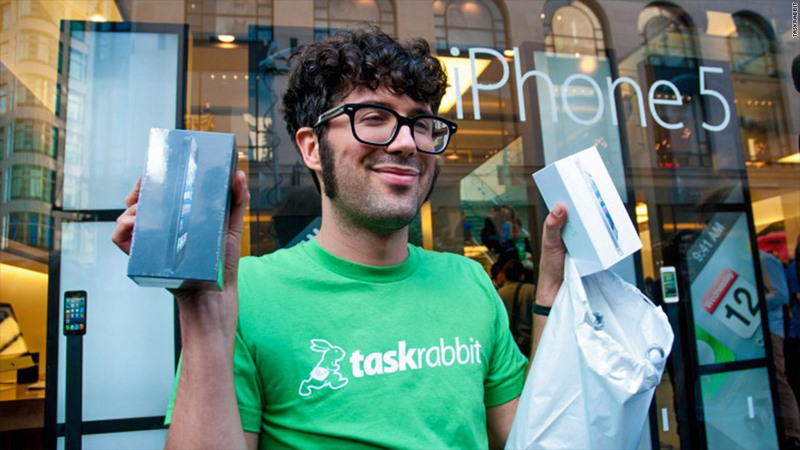 Last year, TaskRabbit said the iPhone 5 launch drew about 350 line-skipping requests in San Francisco and New York City. A TaskRabbit named Charlie scored $1,500 for waiting in line for 100 hours. The poster said he "just had to have the first iPhone 5 in San Francisco," according to Brackett. "Any time that Apple launches a new product, we see an influx of tasks on TaskRabbit," Brackett said. "Apple has a lot of true enthusiasts who can't wait to get those phones, and there's an obvious opportunity for us to help them out."